This weekend is the opening weekend for "Brave," Pixar's latest effort and first feature film led by a female protagonist. The movie has gotten a lot of buzz from the curlies of the world because of curly-haired Merida, a princess who does everything possible to resist her fate in a male-driven medieval society. On a blog post about the film by Jessica McGuinty of Jessicurl, one of the comments reads: "I heard this thing on NPR news this morning and they had to create special software just to do her hair. Too funny. Even animated curls require special treatment..."
For Jessica McGuinty, the movie took on a greater meaning due to the uncanny resemblance between her and Merida. So she decided to play it up to celebrate the opening. Jessica says, "I did everything I normally wouldn't do. It worked!" She put in more Jessicurl Too Shea than usual to make her haircurls softer and bigger, following it with Jessicurl Rockin' Ringlets. She followed that with Jessicurl Confident Coils, raking it in more than usual to make it looser and bigger instead of tighter and more defined. She took the diffuser off for the last 2 minutes of blow drying to fluff it up. She drove to the photo shoot as fast as she could with the top down on her Miata to make it as big as possible. Right before the photo was taken, she bent over and "fluffed it like crazy from the roots." By now you must know of the (seemingly) awesome movie coming out tomorrow called "Brave". It stars Merida, the heroine who, by all accounts, goes against the norms of her traditions and society as much as her large, big, red curls would suggest. The curly hair world has been all abuzz about this movie for months now, clearly. The general consensus seems to be, FINALLY! One of us! The heroine, not the geek in the background getting called mushroom head or chia pet! (These are all presumptions of course, as the movie doesn’t debut until tomorrow.) I think it’s safe to say though, that Merida prevails as the hero at the end of this movie AND that she’s able to do it without straightening her lovely curls as might be done in other movies. Ever since the trailer began airing for this film, many, many, MANY of you wrote to me by Facebook, Twitter and email saying you see a pretty strong resemblance between me and Merida. Nah…REALLY? SO, since that just kept coming up again and again, I thought it’d be fun to grab my awesome photographer Terrence, borrow a bow and arrow and head out in to the woods to take a Brave-esque photo of our own. And I was right — it WAS fun. We got a few strange looks, but I’m used to that by now. But this whole "Brave" thing is so much more than a cool picture or a charming movie, at least to me. I talk to a lot of curlies all over the country with all different hair types and it sounds like a common theme is that to do what we’re doing — to embrace our curls, to LOVE our curls — is something that initially feels quite brave. For me, it felt brave to stop wearing my hair in a bun every single day for 4 years and finally let it loose and curly. For MANY of you the bravest thing you’ve done, hair-wise, was to stop relaxing, do the Big Chop, and allow your natural hair to grow out in all its curly glory. This is NOT just about hair and you and I know it. It’s about choosing to step out into the world and make a statement for which earlier in your life you may have been ridiculed. Maybe you’ll STILL be ridiculed by someone close to you. That’s scary. But you’re doing it. And THAT is brave. You’re telling the world that your hair is just fine the way you were born, thank you very much! 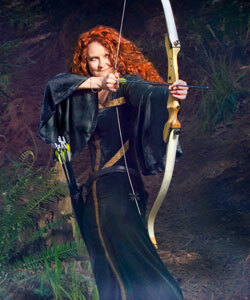 What does it mean to you to finally have a curly heroine in a movie like "Brave"?